The all new SMS-R1 is the culmination of years of labelling experience and customer feedback. A multi-colour printer that will print & cut any shape you wish at an amazingly high speed. Razor sharp texts and symbols printed at a resolution of 300DPI. Productivity, quality, durability, economy, speed, flexibility, ease of use and value for money. 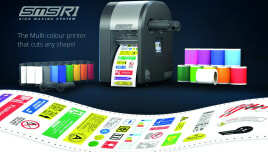 A technical multi-colour printer that cuts, should be accurate, fast and multi-talented! Giving the best value for money possible. Rebo Systems is established in 1976 and has a loyal, knowledgeable and time served staff group. We are widely recognized in Europe as a leading manufacturer and supplier of specialist, industrial sign and labelling systems. We are dedicated to answering the sign and labelling needs of the industry and energy sector. Rebo Systems products give total, in-house, control of the creation, delivery and cost of the ever expanding sign and label requirements of today’s modern world.